This series explores the basics of the Christian faith and typically runs over an 11 week period. Each week looks at a different faith question designed to create conversation. 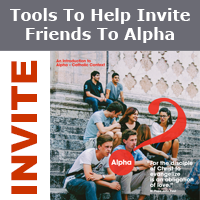 Alpha is geared towards non-practicing Catholics, Catholics, Christians or anyone seeking a better. Call the Parish Office for more information. Join us for Alpha, an 11 week series, exploring the Christian faith. Each talk looks at a different question around faith and is designed to create a conversation. Everyone is welcome. To register, click here OR call the Parish Office at 402-476-8088 ext. 5. Babysitting is provided please let us know the number and age of children attending. Contact: the Parish Office with questions. Can You Invite A Friend To Join You For Dinner And A Movie On Us? Invite your friends, co-workers and family members. Over 80% of all attendees come to Alpha because a friend invited them. Share this with friends and family…….